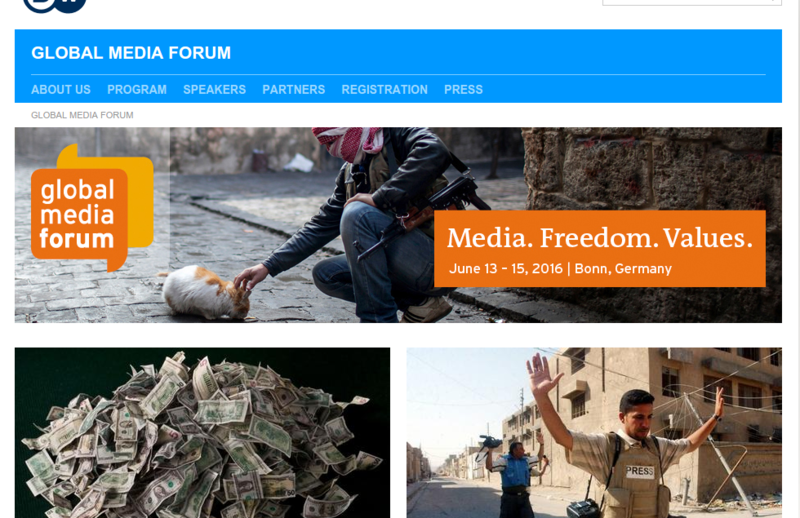 From 13-15 June 2016 you can meet us at Deutsche Welle’s Global Media Forum (GMF), Germany’s international congress addressing the role of media in politics and society. This is the ninth edition of the event gathering about 2,000 experts in the fields of journalism, media, politics and culture, from all over the world. During those days the German public worldwide broadcaster Deutsche Welle hosts this annual world conference at its headquarters in Bonn. This year’s theme is “Media. Freedom. Values”. Topics range from immigration and refugees, press coverage of forgotten crises, over press freedom, to radicalization in social media. Culture, politics and society are an integral part of the event. Technology is well covered, with sessions on innovative media activism, access to information, the African digital revolution, the data explosion and the Internet of Things. A conference app has been created for this event, to keep track of one’s selected programme and live updates. Numerous demonstrations and panel discussions show technological advances and challenges for the media world. The SUMMA project will be presented at the Innovation Projects stand, a dedicated area run by DW Innovation, with a presentation of the technologies envisaged in three multilingual data analysis research projects, i.e. EUMSSI, MultiSensor, and our very own SUMMA. The SUMMA platform, technologies and the external and internal use cases will be described. The session, entitled “Journalistic Research and Algorithms – How To Handle Large Amounts of Multilingual Online Information” will be presented by DW project manager for SUMMA Peggy van der Kreeft. The newly produced SUMMA flyer will help raise awareness of the project among the audience visiting the event and the Innovation Projects stand. Newer Post SUMMA attended meta-forum 2016 Older Post Who will win the US elections? Deutsche Welle launches PollyVote , an evidence-based election forecasting model.